Glasgow. Where tradition meets the contemporary. 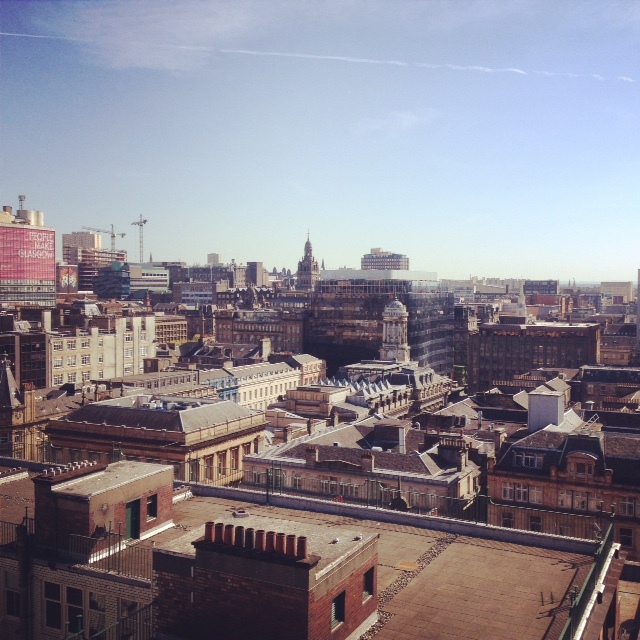 Rolling hills, urban sprawl and hybrid city culture with history: This is Glasgow. What I expected to find was something different; a run down, crime-ridden city with “bad” graffiti laced atop building facades, trains and billboards met with a grimace of displeasure from locals. How wrong I was. This imagined dystopia was instead a utopia filled with art galleries, museums, cafes, hip new hotels and breweries; lots of breweries. Intertwined in the new Glasgow lays a dense history and pride shown through the tremendous architecture, gardens and monuments throughout the city. The view atop the Lighthouse in the centre of town. Staying in the centre of town is an easy way to visit all Glasgow has to offer. With a fitting train and bus network, it is easy to get out of the city into the rolling, green countryside, whilst being a stones throw away from all the major city attractions. I stayed at Z Hotel, a relatively new branch of uber hipster meets business hotel that sports tiny rooms with all the essentials in modern buildings, perfect for a few – fly in, fly out – nights stay. Affordable and chic, Z Hotel has a lobby café and bar open to the public, excellent wifi connection and cable TV in a Japanese style, pod room with a surprisingly spacious bathroom. With prices from £40 a night, the Glasgow branch is situated in the middle of town in an old printworks building and displays beautiful views of the city. Stepping outside the hotel, there is loads of culture to take in. Off St Georges Square, the Gallery of Modern art showcases local artist installations and contemporary works from range of artistic mediums. The Lighthouse is a beautiful building that is one of the many places paying homage to local hero Charles Mackintosh. The Lighthouse was the Architects first public commission (before he subsequently left Scotland and never returned) and was used as the printing office for the Glasgow Herald. In the late 1990’s the building was restored after years of lying dormant and is a wonderful museum that showcases Mackintosh’s career (just one of many in the city). If you’re not afraid of some climbing, you can visit the rooftop of the lighthouse to see 360-degree views of the city from the very centre of town. 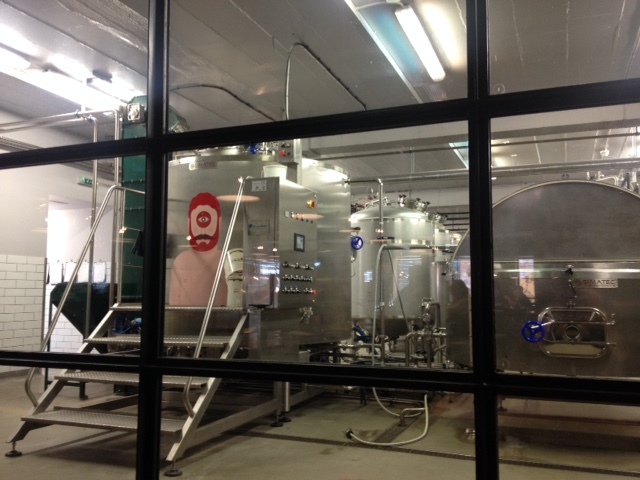 A view from the brew bar into the brewery. For a pit stop that could turn into a long afternoon of eating and drinking, Drygate Brewery is a necessary visit. A side project of mega brewers Tennants Breweries this craft brew house is more than a rapidly growing beer experiment. With a brew house bar and kitchen, beer hall and terrace, not only can you sample some of the best beer east side of the Napa Valley but, taste some well balanced, gourmet pub grub. If you choose to sit in the brew house, you can watch the brewers at play through the open facing windows leading into the microbrewery. With food ranging from pan fired mackerel, truffled herb gnocchi and ham hock, you can also get the usual favourites with a twist of elegance from the ox cheek burger, beer battered fish and chips and sausage and mash. To wash it all down, there are 24 beer lines, eight rotating casks and 16 keg lines to choose from, offering Drygates finest including bearface lager and the Gladeye IPA as well as a range from Tennent’s and international breweries. 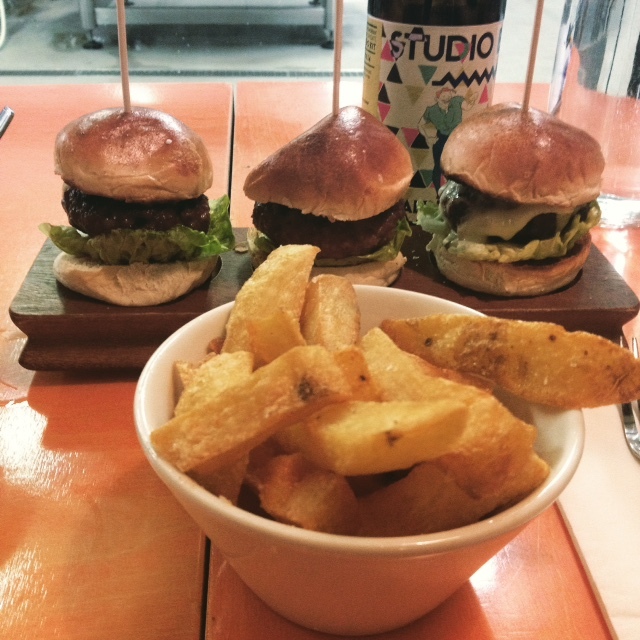 Drygate brewery beef, venison and lamb burgers with fat chips. After all that food, a touch of history is in order. You can find this through the monumental gothic cathedral and surrounding cemetery that centres the city. Here you can wander the grounds of the cemetery that climbs the surrounding hill over the cathedral offering breathtaking views of the medieval structure below. Some of the largest totems are scattered over the hills between ancient, mysterious and broken tombstones that have weathered over the centuries. The church is free to enter around scheduled services and is well worth the visit. Glasgow is known for its university, student culture. Head to the outskirts of town and wander around the beautiful campus at Glasgow University. 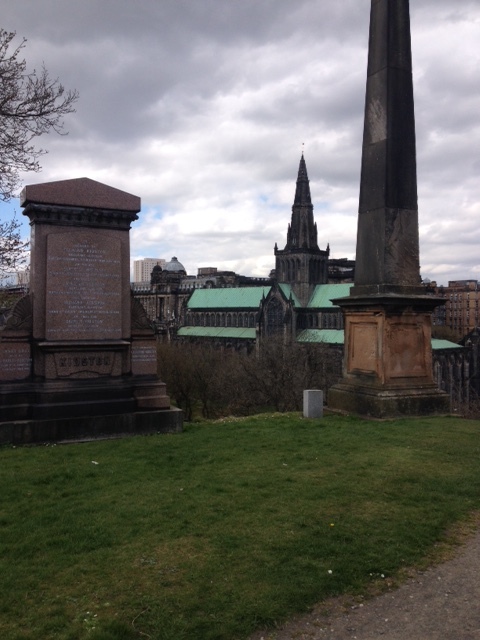 You’ll also come across the river and the Kelvingrove Gallery and Museum in the west end of town. With over 22 separate galleries, the space is home to a range of art works from around the world, natural history and ancient antiquates, world culture and Scottish archaeology open free to the public every day. Glasgow is full of contemporary and historical treasures with a rich culture from art galleries and museums to some of the best new beer on the craft market, the city full of things to explore. ← Spice makes its way to Berlin this summer.